Car door and ignition locks are ever-changing and increasingly complex. ABC Lock and Key offers experienced, fast, high quality, dependable locksmithing services and we know today's key codes and automotive computer systems. We have the specialized cutting machinery needed to produce a key for your automobile locking requirements. 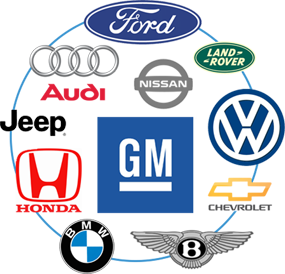 Our high quality car door unlocking is as safe as using a key and our ignition and car alarm services are unparalleled. You can trust us to get the job done right with no worries or damage to your car. ABC Lock and Key makes Windshield Repair and Replacement of your auto glass price competitive and worry free. If you need fast, friendly auto glass repair or replacement, we are the glass company solution for you. We install car alarm security, remote start and keyless entry systems. ABC carries quality, name-brand products to keep you and your vehicle safe. We provide and install the newest, specialized, high tech car alarm and security products so you can protect your car, truck, or recreational vehicle. We have the professional technicians and latest technology, everything you need for your car security and remote start solutions. Protect your loved ones, yourself and your vehicle with confidence. ABC Lock and Key will help you make sure your air conditioning system will keep you cool all season long. We can troubleshoot to prevent future troubles, identify problems and fix non-working air conditioning systems. ABC Lock and Key provides the best in class for your car's air conditioning repairs. ABC Lock and Key uses the latest computer technologies for testing and diagnostics. We find and troubleshoot auto problems. We can improve your car's overall performance. We provide Check Engine Light Services. ABC Lock and Key assures you that your vehicle will receive the best technical auto diagnostics.